Welcome Back. 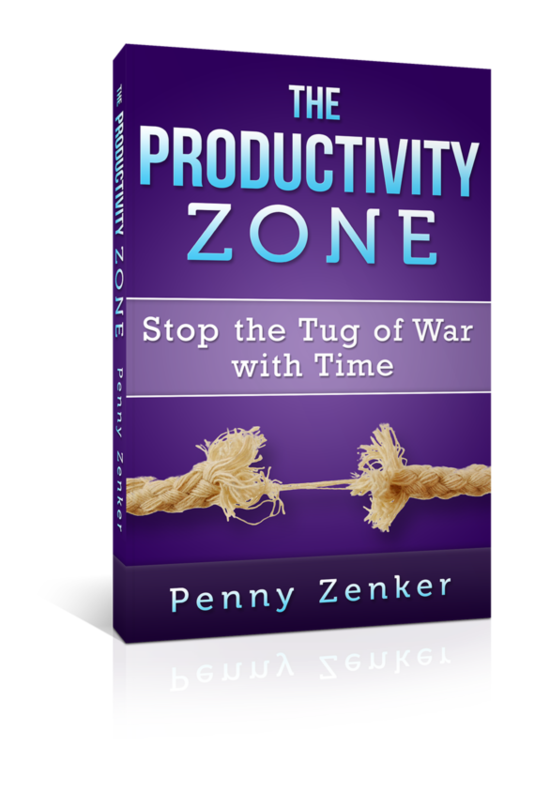 I am Coach Penny Zenker and we are speaking with Suzanne Yvette about the x factor in achieving greater productivity. The next question I am going to ask you is one I ask every guest because I love the variety of answers. How do you define productivity and why? S: By focus plus energy equals productivity. Focus is the first element. I have a method where at night I make my busy lists. I do ten things before ten. Once that ten is done, checking email, following up with the bank, writing a check, calling the dog groomer to come out. I get that done in a certain time frame. So then I can grow on what makes me grow. Focus on something that is purposely driven. If I give that all my focus, then the energy comes. That energy keeps me staying present to accomplish the task. Focus plus energy equals productivity. P: Energy is uh, what I say is how we really create that productivity. Not just what we do with our time. It’s also how we show up. That energy factor and how we feel about what we accomplish. I love, love love what you said. Focus is again, it’s one of those areas of championship psychology which make up that energy factor. We are in alignment, but I am not surprised. Are focus and energy the main factors for you in productivity? Any other ones? S: I have to tell myself that I have to remind my clients that doing busy work is inevitable. You will never get away from it. Embrace the busy and get it out of your way. Then focus on what is going to support your bottom line. Where are you going to get the most credibility out of your day? I guess, embrace the busy. P: I like that. I like your ten before ten and the concept of getting those busy things out of the way. Give it a time frame so you can really focus the rest of your day on the things that are most important to drive you forward. Great tip. Do you think there is an x factor? Is there one thing that what would make that shift that makes all of the difference, what is that thing? S: My biggest shift since starting my company is procrastination. I had to define what that was to me. It was lack of focus. I could get distracted by anything. I could go out and walk in the yard and be distracted. Focus to me was the x factor. What I had to do to get over that procrastination. P: What do you think is underlying that? Is there something else? You got focus and what do you get focused on? S: I got focused because the energy follows. If you are so focused and ready for the outcome, you have visualized it, focus is the easiest thing to do. If you are not seeing where you are supposed to be, you are not going to follow, you will procrastinate. But when you are visualizing where you are at, you do everything you can that whole day or evening, to get to that place. It becomes unstoppable. It flows like a well-greased machine. P: My interpretation is that underneath that, in order to focus you need to have clarity. When you have clarity of that purpose, it enables you to get focused. P: Also, when you get that clarity, it opens up the ability to get a plan. When you have clarity and then you can create a plan to break things down. Procrastination to me, is a lack of focus. That could come from a lack of clarity and also a little bit of fear. When you have clarity of purpose, do you have fear? S: Some people have fear of success. P: More people more than you think. They actually have fear of success or fear of success at the next level. Not where they are right now, but they have a norm. S: Focus helps me get over that fear. I see that cliff all of the time. Just that little push past the cliff gives me the energy to continue on. P: When we tap into our passion, it taps into our courage. Just linking that point to this. S: It also give my breast cancer survivors and thrivers seeing themselves healthy. The vision of where we are going to be. Getting them to not focus on the sickness but to look to the healthy. P: I help people to break through obstacles like fear, limiting beliefs, etc. When we break through these obstacles we make great shifts in productivity. Sometimes it’s not about adding, but taking away, resistance. A great mentor of mine, he told me and made me appreciate that his job wasn’t to motivate me, it was to remove the obstacles so I can tap into my natural motivation that I had and I can flourish. Do you agree with that philosophy? Maybe you can share your concept. S: One of the things that I have found that I run 3 businesses right now. I have to focus on my tasks. What my clients can do to get themselves up to speed. I set specific times with them to work on their focus. What are their obstacles? We have to get out of own way. It’s ok to ask for help. One of the things I do specifically is work with them on how they can be strong and supportive to their family and yet still be vulnerable and ask for help. The same for the veterans. They have been strong for so long, it’s ok to say, I can do this differently and or better. I think it’s critical in anyone’s life. P: She comes home from a day of chemo and is exhausted and has to make dinner or take care of the household. It’s a part of what she does to support her family and part of who she is, right? It made me think of an experience I had with my son last night. He is deciding that he doesn’t want to play the saxophone anymore. I was surprised when I said would you like to quit? I shouldn’t have used that word. I should have said stop. He started to break out into tears. I said what is the matter? If it’s not right for you, then you can try another instrument. I would rather you focus your energy and efforts on something you enjoy. His answer was in karate, we have one of the mottos, winners never quit, and quitters never win. He said that to me. I said, oh my, uh, and I helped him to appreciate that in this context, it wasn’t quitting because he gave it a half a year to work with it, it was prioritizing on what was most important and most needed in his life. The reason I am bringing up that example is because that was a limiting belief that he had, right? That he needed to see it from a different perspective to let it go. It’s a similar type of thing of having limiting beliefs about what we need to do in certain situations. In those circumstances, they need to remove those obstacle that are holding them back. S: Not only the obstacles and being vulnerable, but giving ourselves permission. As women we multitask and have all of these responsibilities because we are women. I really work with these girls with being ok with saying, I give you permission to be sick today because you just had chemo. Save that energy. Store that up and let’s tackle it tomorrow. P: Well said. We try to manage something that is out of our control. It creates stress and frustration. We need to be more focused on what we can control and that is going to help us make all of the difference in how we manage our energy. Earlier I talked about the energy aspect in championship psychology and energy management. Those two are the same thing. I would like to introduce those four areas and get your opinion. Is that ok? Each of these areas represent a way to increase the positive energy that drives us. It’s also the difference that makes a difference between what you talked about in surviving and really thriving. Purpose- we already talked about that in that it is a driving force of our energy. It’s that raw fuel. From there we can direct it in a lot of different directions. Do you have anything further to say? S: I think that one of the things most important for me when I get up is to remember my purpose. To say my purpose: I am a leader. I am strong. And refocus that right back into my heart and soul. My purpose has to be every morning and every evening. It flows in between. P: A daily practice of connecting to your purpose. Secondly, is focus. You heavily appreciate the value of focus and shifting focus. Culturally, we were once focused on innovation and what we want to more procrastinators and what we don’t want. How do you use shifting focus as a tool for yourself and with the women you are working with? S: Our country has gone into that procrastination state, I agree with you. I would say it took me a month to 60 days to brush off the dust and toxins of corporate America because it was so predictable. Then I had to deal with the unpredictable. That was me and getting out of the way. I had to focus on getting the job done. I look back on that and it taught me a lot about who I am. The more I learned about my abilities as an entrepreneur and a philanthropist, it fueled more for me to continue on that. P: Focus is paramount. When we focus on what we want, we will get more of that. When we focus on what we don’t want, we will get more of that. It’s that simple. S: One of the things they teach you in the military is to focus on the mission. It teaches you strategic planning. P: Let’s talk about language. The power of language. Because it is the words that we use consciously and unconsciously that form the questions that we ask ourselves and others. It comes out in our language. We hear ourselves say something and it’s a realization of what’s going on inside. It’s very powerful. How do you use language as a critical success factor with the women you work with? S: When the women go through breast cancer there are body and mental images. It’s all a process. Sometimes we can get ourselves wrapped around our internal thoughts. I am not pretty. I can’t go anywhere without my wig. I don’t have eyelashes. What I do is turn around the thinking in saying yeah, you can go anywhere bald because you are beautiful. We give ourselves permission to be healthy and productive. Using the right language gives us the strength to move forward. Walking into the chemo room, walking onto the battlefield for the vets, we use our internal language to say we can get through this. Focusing on the positive will give you the courage to move forward. P: It shows you how these 4 areas are intertwined. There is that dreaded self-talk that brings us to negative focus. Or it’s the positive self-talk that gives us strength to move forward. The reason I break them into specifics because the more we can break it down, it’s like planning, right? If we have this big goal, it may seem too big to address or approach it. If we don’t know the individual elements, we can’t create it for ourselves or break it down to find out what we need to work on. Let’s talk about labels. They are a dangerous part of our language and the emotions we create attached to these labels that either we give ourselves or others give us. Can you add to that? S: I learned in the military that the label of being a woman was just not acceptable. I had to fight through that stereotype. I could be a jet mechanic no matter if I was a man or a woman. It was a good four years before I started being accepted. Then the next label was being a widow. I wore that one well. I was told by the military that I would be taken care of as a military widow for the rest of my life, which is true. I started using that as my identity. I was still a very vibrant woman at 26. But I wore the widow thing too well. I should have been more gregarious about my life. My daughter can’t believe I never got remarried. Then being a breast cancer survivor. I wore that well. I had to get past survivor and I didn’t know how. It’s been 11 years now and it’s been a journey to stop using the label of survivor. I think we can get the word thriver as a much more positive word. My thoughts are to look back on the past and think to the future, labels can be beneficial for a time period. Once they are no longer beneficial, and you have gotten through that emotion, it’s time to move forward and create a new label or word. Create a new future. P: It’s amazing again, the intertwining of the self-talk and focus around labels. How we own them and whether they are positive or negative. When we take it into our identity it is then intertwined into our purpose. It’s either driving that windmill in a positive direction creating more potential for ourselves or going the opposite way. The labels no longer serve us or apply and we are not able to let it go. That is so key. I never thought even the label of a woman, that simple label of woman, or man, a never thought of that. The limitations that it may hold. Also, the labels we use around us. Especially for our children. What are we using around them? Food for thought for our listeners. The fourth area is physiology. We know that to be mentally fit, we need to take care of our mind and body. Dr. Dunkin and I talk about this as the number one factor that affects a threshold for our triggers. We have a program and a method around trigger management. Being able to really manage our emotional triggers. When we don’t get enough sleep, we are less patient. We have less mental stamina to deal with challenging triggers that may come up. With the women you work with, there must be a number of emotional triggers that they have around them. How do you see physiology supporting them in their process to thrive? S: The diet is the first thing we talk about. Where are you in your own passion for recovery? The doctors tell you to have certain medicines. What are you doing to fuel your body with so that you can make that next transition? You have 7 days or 2 weeks until the next one. What do you do to give yourself that strength? We focus on the mind, body and food. I rode horses for a while. After my first mastectomy I was really scared that I couldn’t lift my saddle onto my horse. I had to start lifting light weights. I had to recondition my body to overcome the medically issues that I had. The girls in the ranch always offered to throw my saddle and I would say no. It sure was a win once I was able to do that for myself. We talk about how we feel about our bodies. Does he still love me? It’s not about anyone else, it’s about you. Do you love yourself? What is your passion? Your success after this? Do you want to help other people? Become a supporter? For the women vets, who are we going to help next? It’s always about contribution. P: What a great summary there. To sum up what championship psychology is. Those four areas again are purpose, focus, language, and physiology. It’s time for our last break. Stay tuned.